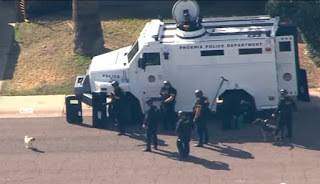 PHOENIX - As police were working to negotiate with an armed robbery suspect barricaded in his Phoenix home, a little dog wandering the street tried to pick a fight. Air15 video showed what appears to be a pug running up to police and then running away when officers tried to catch him. The pug and police dog appeared to be barking at each other before officers "shooed" the pug away. It happened in front of a home near 43rd and Northern avenues after the suspect robbed a Subway restaurant. Police were in front of the home for more than four hours.